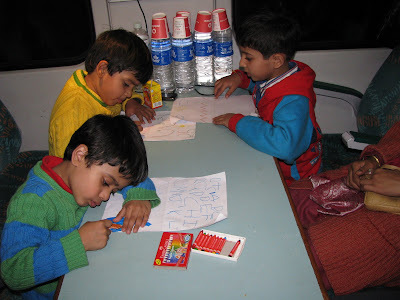 On the train from Chandigarh to Delhi (Shatabdi Express), our seats were right in the center where we get a table. So the crayons and paper that I had carried came to the rescue and I managed to keep the kids busy for good 1 hour. There is the sun, the clouds, the mountains covered with snow(blue bit on top of mountains) and with fir trees growing on them. He drew a horse (pink one) and a monkey (blue one). he also drew the big boulders he saw near the mountains and in the river Beas (black and brown ones). I think he did a splendid job of drawing a summary of his Manali trip. What says you all? He did a splendid job. He sure knows how to summarize things. It'll remain in his memory for quite sometime. Looks fantastic! But, I have seen him draw amazing things about a year ago. (Rishab is no ways near that.) So, I'm not surprised. corection: "didn't do it 'away' not 'way' with...."
Cuckoo..I've disabled anonymous commenting because of some stupid people leaving stupid comments.